First official record: Francis Meres' Palladis Tamia (1598); referred to as "Midsummers night dreame." First published: published in November or December 1600 as A Midsommer nights dreame (printed by Richard Bradock for Thomas Fisher). This text was republished in 1619, with a title page date of 1600 and the name of the printer James Roberts. However, this reprint was part of William Jaggard's "False Folio" (printed by Thomas Pavier). The play had never been printed by Roberts. First recorded performance: possibly on 1 January 1604 at court, when Dudley Carleton, 1st Viscount Dorchester reported to John Chamberlain the acting of a masque "of Robin goode-fellow." The first definite performance took place on 29 September 1662 at Drury Lane, as reported by Samuel Pepys, who described it as "the most insipid ridiculous play that ever I saw in my life." 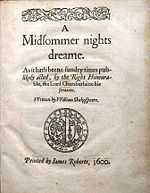 Evidence: stylistically, Midsummer Night is very much part of the 'lyrical plays', which would suggest a date of composition in 1594 or 1595. A strong argument that it was written immediately after Romeo and Juliet is the nature of Pyramus and Thisbe, which features a pair of ill-fated lovers who arrange to meet in secret and which ends with the heroine killing herself over the body of her dead love. In his 1979 edition of the play for the second series of the Arden Shakespeare, Harold F. Brooks argues that Shakespeare used the source story from Ovid's Metamorphoses first to examine the tragic potential and then to exploit its comic and farcical elements in his next play. A possible topical allusion is the line "the death/Of learning, late decreased in beggary" (5.1.52-53), which could refer to the spate of deaths of popular playwrights in the early 1590s; Robert Greene in 1592, Christopher Marlowe in 1593 and Thomas Kyd in 1594. That the play culminates with the marriage of Theseus and Hippolyta has led some to theorise it may have been written specifically for a wedding, with the most likely candidates being either the marriage of William Stanley, 6th Earl of Derby and Elizabeth de Vere on 26 January 1595, or that of Sir Thomas Berkeley and Elizabeth Carey on 19 February 1596. That the second is the more likely of the two is due to the fact that Elizabeth's grandfather was Henry Carey, 1st Baron Hunsdon and her father was George Carey, 2nd Baron Hunsdon, successive patrons of the Lord Chamberlain's Men. If the play was written for a wedding in February 1596, it was most likely composed in 1595. However, there is no solid evidence to suggest that the play was in fact written for a wedding, and most scholars are in agreement that stylistic evidence alone is sufficient to date the play to c.1595.